I have a huge list of bookmarking a recipe and then forgetting/waiting to make the recipe. Then I try to save the ingredient until I finally make the recipe. So, I hold onto ingredients perhaps a bit longer than needed. This is my challenge to e I have bookmarked this One day I was searching for varietys of eggless cake recipe and I came across this recipe from Priyaand from Gayathris Blog. Priya is a wonderful blogger I am great fan of her bakes.I bookmarked the recipe and forgot all about it. Finally made it today. 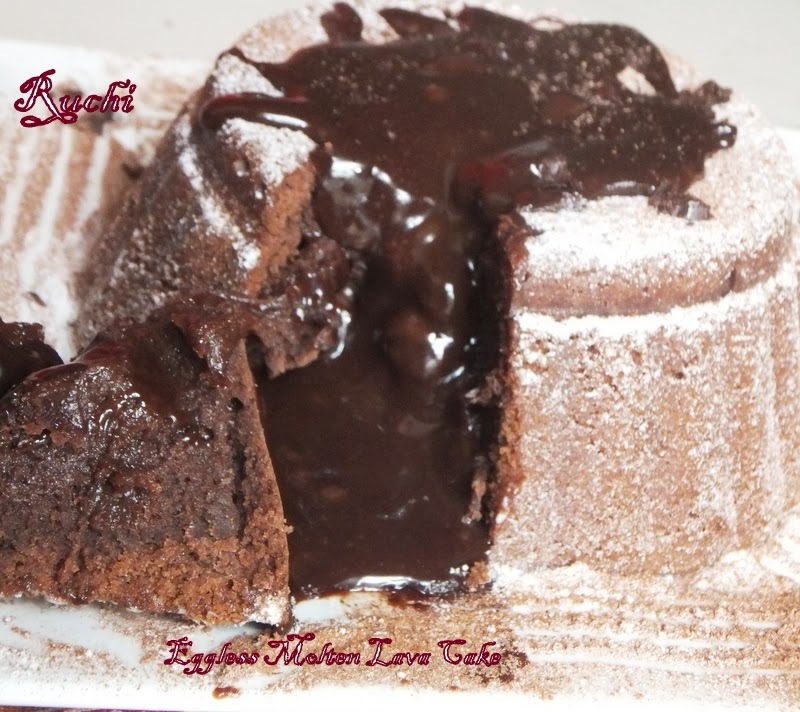 What is a lava cake – well it looks like a normal cake, but when cut, chocolate lava flows from inside. 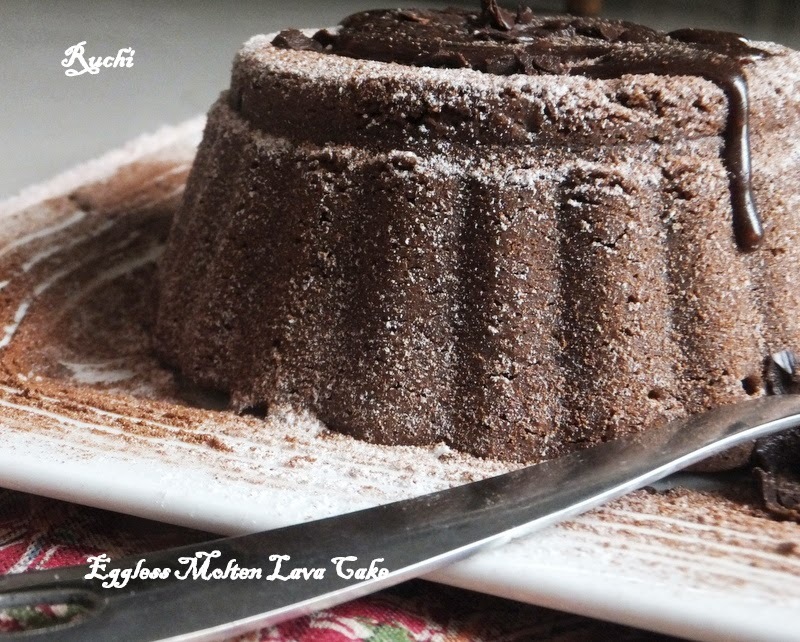 The burst of chocolate lava from the middle of the cake can melt any chocolate lover's heart! 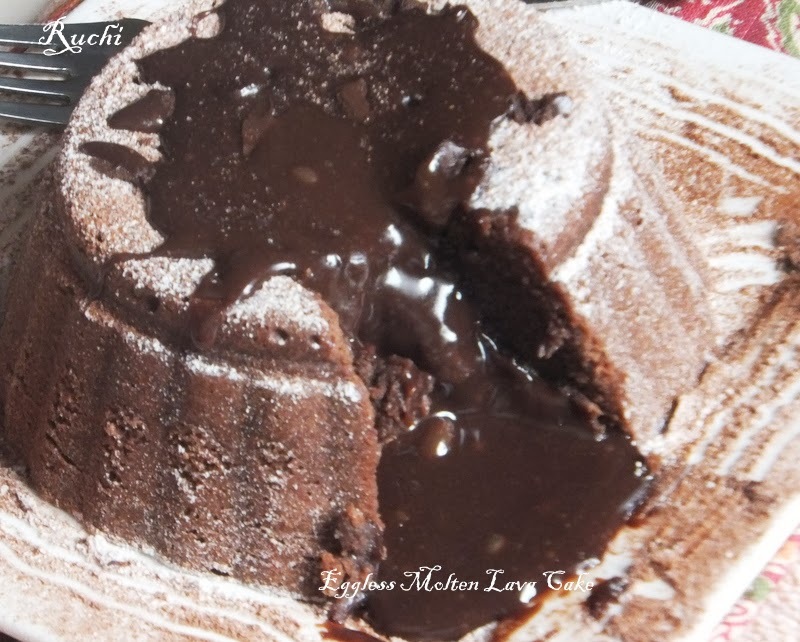 This cake is perfect fix for chocoholics and rises wonderfully and lava oozed out well on baking .In home every one loved this cake The chocolate lava was so drool worthy and yummy!! 2. Sieve the flour with baking powder and baking soda, keep aside. 3. Melt the chocolate with butter in microwave oven for 2minutes.Add the sweetened condensed milk, to the melted chocolate, mix well. 4. Finally add the flour and mix well. Add the milk, 1 tablespoon at a time, and mix well to get a smooth batter. 5. Grease your ramekins with some melted butter (so that the cake will come off cleanly when it is baked). 6. Pour half of it into a microwave safe bowl and push the chunk of chocolate right into the center of the batter. 7. Top it with the remaining batter, taking care that the chocolate doesn’t protrude out of the batter. 8. Bake for 15-18 minutes. When it is baked, remove ramekin from oven and let cool for 1-2 minutes. Then gently unmold it on to a plate and slice it up to find delicious chocolate oozing out of it!! 9. Dust with icing sugar over the cake and serve warm along with fruits or Serve with a scoop of ice cream. Omg, who can resist to that oozing chocolate akka,loving it.